The Sonnenalp sets the stage for a spicy jazz club scene on cold winter nights! Go to a jazz club in any of the world’s major cities and it’s abuzz with an unmistakable sizzling magic on show nights. There is not one, but two performances – one for the earlier crowd and one for the later crowd. The acoustics envelope the intimate audience and the artist delivers something special to each crowd. This scene is coming to Vail, Colo. this winter with the all-new 2017 Vail Jazz Winter Series. The Series features four artists, each filling a diverse corner of the vast jazz umbrella. For the first time in Vail Jazz’s 22-year life span, the Winter Series will take place at Ludwig’s Terrace in the Sonnenalp Hotel. Surrounded by glass on three sides and the roof with the stars shining through, the space checks every characteristic off the list as far as an elegant and classic jazz lounge setting with the added benefit of its distinctly alpine appeal perched in the woods at the base of Vail Mountain. Seating will be club style, around small tables offering a special menu featuring a full bar and scrumptious small and large plates available for both performances – the 6 p.m. set and the 8:30 p.m. set. Doors open 30 minutes before set time, enabling guests to pick seats and place orders. Interestingly, the Professor – Adrian Cunningham – is not old at all but is certainly well-schooled when it comes to playing instruments. Growing up in Sydney, Australia, Cunningham started out on the piano before taking on the clarinet, flute and saxophone. After establishing himself as a standout talent in his mother country, the Aussi relocated to New York City where he began performing with the likes of Wynton Marsalis, Wycliffe Gordon, Chris Potter, Renée Marie, George Coleman Jr. and Bucky Pizzarelli, becoming a regular at the Blue Note, Birdland and Apollo Theatre. 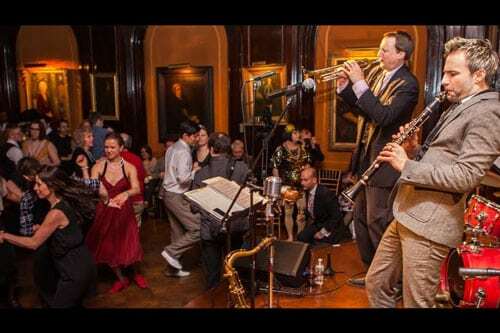 In 2012, Cunningham donned the Professor hat and took up with Old School, a rotating ensemble of high-energy, NYC-based musicians specializing in the New Orleans tradition but also known to steam up the room with R&B, hot jazz and swing. This performance marks the return of the Professor after he established a strong following at the 2016 Vail Jazz Party. 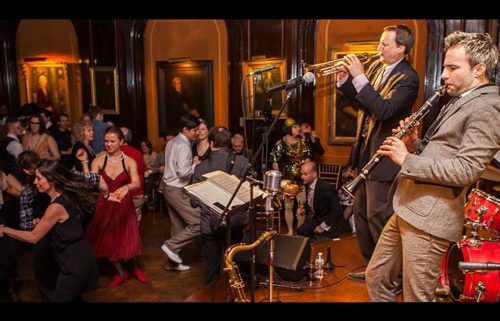 The Vail sets will hone in on swing music from the 1920s, so be sure to bring your dancing shoes. No stranger to Vail, guitarist Diego Figueiredo has been a favorite among Rocky Mountain jazz fans for years. His lightning fingered virtuoso style flirts with classical, bossa nova and traditional jazz as he puts his own stamp on standards from the American Songbook as well as classics from his native Brazil. Teaming up with the upbeat, zinging deliveries of Italian vocalist/songwriter Chiara Izzi, the duo is a surefire recipe for star power. Winner of the Montreux Jazz Festival’s Vocal Competition in 2011, Izzi has since relocated to New York City and has begun raising eyebrows for her uncanny ability to interpret – in her own distinctive way – jazz traditions from all over the world. The energy emanating from this international pair is not to be missed. Capturing the vibrant spirit of legendary vocalist Peggy Lee is no simple feat, but Nicki Parrott has been refining her versatile musical skills since the age of 4. Hailing from New Castle, Australia, Parrott moved from the piano to the flute to the double bass by age 15 and by the age of 16, was winning song composition contests. After moving to New York City, Parrott’s vocal talents were recognized by the one and only Les Paul and she became a mainstay at his Iridium Jazz Club Monday night session. Even when not channeling Peggy Lee, Parrott’s voice swings hypnotically and powerfully, even more so when she’s plugging away on the bass. Hailing from a bloodline of piano kings three generations deep, Jesus “Chuchito Valdés can make the keys smoke like no other but can also draw out deep sentiment in the rich veins of classical mixed with his native Afro-Cuban jazz. Possessing enormous talent for creating original compositions, Valdés’ tunes often drift into the swirling waters of Bebop, Cha-Cha-Cha and Danzon. He has been enrapturing audiences around the world and recording music for the last 15 years, doing his father and grandfather proud. Tickets are on sale now for the 2017 Vail Jazz Winter Series, which also includes two invitation-only performances at private residences – in February with Eric Alexander playing the Great Songs of the Tenor Sax and in March with husky vocalist and guitarist Bob Margolin, former member of Muddy Waters’ band. The Winter Series performances at Ludwig’s Terrace at the Sonnenalp take place at 6 p.m. and 8:30 p.m. Tickets are sold separately for $35. Prices increase at 5 p.m. day of show. For tickets or more information, please visit vailjazz.org or call 888-VAIL-JAM.